When she was seventeen, Abigail Lyons found herself in front of a mansion in an exclusive neighborhood. There, a foster family awaited her, and the Aherns truly were the ones who would change her life for the better. She had foster parents that cared about her, and she had two foster brothers as well, but it was the elder of the two who would become her best friend--Weston Ahern. Over the next few years, she would pursue her degree and live a far better life than she imagined for herself, but it was Wes who would always remain her touchstone. Back in Colorado, Wes was in closer proximity--this man who went the world to her. He was her brother in name, but there was nothing familial about how she felt about him...and him about her, but that was a fact that Abby wasn't fully aware of. 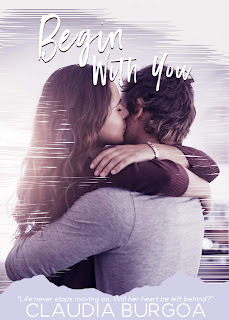 But as well as Wes may know Abby, there are things about her past that she's kept from him, things that she's been trying to outrun for years. Could the time have finally come for her to be rid of her past and take a shot at confessing her feelings to Wes? What happens if Wes rejects her, or worse yet, her past comes to take her back? Purchase Begin with You on Amazon | B&N | iBooks | Kobo.